You already know about face wrinkles and how to prevent them. You’re probably even aware of neck wrinkles, too. But have you ever heard of chest wrinkles? It turns out that the upper chest area is susceptible to signs of aging because the skin is extremely thin. The two biggest causes are volume loss and repeated folding of the skin, as told to Byrdie by Rachel Nazarian, MD, of Schweiger Dermatology Group. Just like your face, your chest needs protection from the sun since collagen is degraded by sunlight. Don’t worry though—we found the most effective products to help prevent and reduce chest wrinkles. What’s the easiest way to prevent wrinkles? “Sunscreen, sunscreen, and sunscreen,” Audrey Kunin, MD, a board-certified dermatologist told Byrdie. “Preventing sunburns in this area earlier in life will go a very long way to prevention.” Dermatologists recommend using an SPF of 30 or higher, like Elta MD UV Sport Broad Spectrum SPF 50 . This oil-free sunscreen works well for people on the go since it’s both water-resistant and noncomedogenic, making it especially ideal for those with sensitive skin types. If you’ve already had sun damage and notice premature aging, your best bet for plumping up the skin is retinol. Nazarian recommended the vitamin A derivative as it induces collagen production in the skin. “Once the deep lines form, more aggressive treatment may be necessary,” Kunin said. If you’ve never used retinol before, try out SkinMedica Retinol Complex . Made for first-time users of all skin types, the retinol-based night lotion renews the skin’s tone and texture without any irritation. Start by using it twice a week to build tolerance to the formula. In addition to applying retinol, Nazarian recommended including antioxidants such as vitamin C and E into your skincare routine. Serums are extremely effective as they penetrate deeply into the skin, delivering a high concentraction of active ingredients. We recommend using iS Clinical Pro-Heal Serum Advance as it’s formulated with vitamins C, E, and A. Plus, it also contains olive leaf extract, which increases antioxidant protection and healing. Once you’ve smoothed the serum on your chest, follow up with Revision Skincare Vitamin C Lotion for optimal results. This skin-brightening lotion contains a high concentraction of vitamin C, making fine lines and wrinkles minimize over time. For an extra boost, use a firming mask every week like Skinceuticals Vitamin C Firming Masque . This product tightens and exfoliates the skin, revealing a firmer appearance instantly with added radiance. Nazarian said she loves procedures that trigger the production of collagen and elastin like micro-needling and Fraxel laser. However, if you don’t have the time (or the money), we have a solution: Peter Thomas Roth Un-Wrinkle Peel Pads . This alcohol-free chemical treatment delivers results just like a professional peel would as it stimulates cell renewal, ultimately minimizing the appearance of wrinkles and evening out skin tone. Plus, using these peel pads also allows following treatments to be better absorbed into the skin. Avoid using strong cleansers as they strip natural oils and irritate skin tissue, Nazarian said. You can also use adhesive chest sheets like the SiO Decollete SkinPad, which “can smooth our lines that are caused by creasing while you sleep, especially if you’re a dedicated stomach-sleeper.” Kunin added that wearing a lightweight bra may also be helpful as it keeps breasts from being pushed together if you are a side sleeper. With all of these tricks and products, your chest will be smoother than ever in no time. Choosing the right skincare products can be a tricky thing. Once you’ve settled on a regimen, you have to make sure you’re using your products in the right order, applying them at the right time of day, and treating your concerns effectively. It can be mind boggling simply navigating the skincare aisle at the drugstore! That’s why we’ve broken down the fine art of caring for your skin. Here’s everything you need to know. Q: In what order should I use my skincare products? It’s no good having a great collection of products if you aren’t applying them in the proper order. The first step is to remove all traces of dirt and debris with an effective cleanser formulated for your skin type. The goal is simply to start with a clean canvas. Make a commitment to exfoliate dry skin two to three times a week with a gentle scrub. Focus on those areas where clogged pores are most prominent, like your cheeks and nose. Follow with a serum that’s packed with ingredients that target your skin’s unique needs. Formulas enriched with retinol’s and hyaluronic acids are designed to target aging, while nourishing oils lock in moisture for dry skin. Remember to pat your serum on—don’t rub. Next, pat eye cream on gently, taking care not to rub or tug the delicate skin in this area. Work your way from the outer corners of your eyes and down along the orbital bone. Then apply moisturizer. 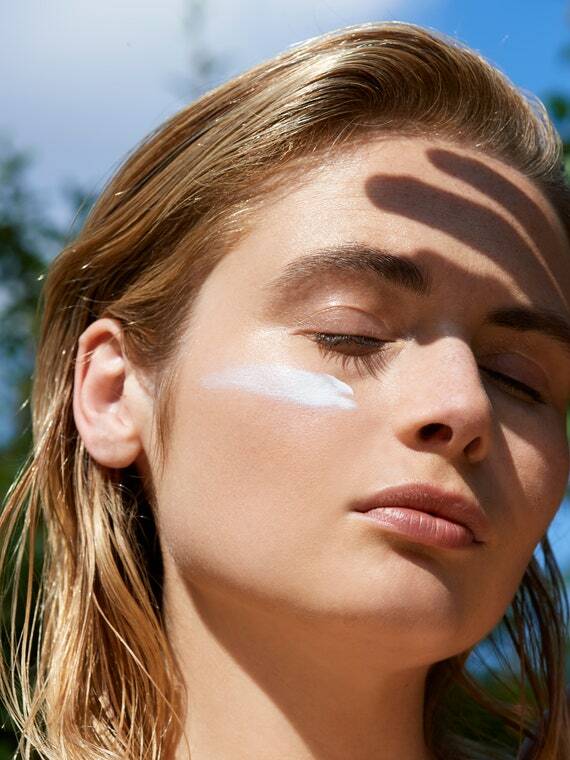 Your final step is sunscreen, which is essential if you’re headed outdoors. Q: Can I use a face oil if I have oily skin? It may sound counterintuitive, but face oils are remarkably effective even on oily skin. They key is not to go overboard in your usage, and to stick with nourishing ingredients that help balance your skin. We like Peter Thomas Roth Oilless Oil 100% Purified Squalene ($23.99) for its gentle, non-comedogenic formula. If you find that most oils feel too heavy, look for a product specifically formulated as lightweight. You might also want to add just a drop to your nighttime moisturizer instead of slicking it onto your skin full throttle. Nighttime is definitely an important qualifier, too: your skin is less oily at night, so it’s best to apply your face oil right before you hit the sack. Q: What’s the difference between a hydrator and a moisturizer? Thought the terms are often used interchangeably, hydration and moisturization are two different concepts. Hydrators are designed to increase your skin’s water content, while moisturizers lock in moisture to prevent that water content from being lost. This is why it’s advisable to apply moisturizer to slightly damp skin—it’s the water that keeps skin hydrated, while the moisturizer seals that hydration and keeps skin soft and supple. For extra dry skin, we love Skinmedia HA5 Rejuvenating Hydrator ($329.89) to really ramp up your skin’s ability to combat fine lines while maintaining a smoother, healthier complexion. Q: How long should I wait before applying sunscreen? You’ve slathered sunscreen all over your face and body about 20 minutes before heading outside. You’re good to go—for now, at least. Pay attention to your sunscreen’s SPF rating. That number indicates how much time you can safely spend in the sun before your skin starts to show signs of damage (like pinkness or redness). As a general rule of thumb, it’s a good idea to reapply sunscreen after two hours. If you’re using a water-resistant formula, note that their efficacy times may differ. So if you’re swimming or surfing, be sure to reapply as often as the packaging instructs. One of our favorite head-to-toe formulas is Avene Mineral Light Hydrating Sunscreen Lotion SPF 50+ for Face and Body ($24.99).